We needed a sturdy, well built helping hands device for use in our product development studio. The ones on the market we tried were flimsy, hard to adjust, and came with tiny little bases that would tip over with anything but the smallest project mounted to them. Plus, we needed some extra "hands" to make it truly useful. Four all metal flexible 'gooseneck' arms can be put exactly where you want and they'll stay. No more fumbling around with tiny set screws or other hard to adjust arms. Just move them where you want and let go. The solid steel base is a stable 8" by 8" with a heavy powder coat finish. Supported by four large rubber feet, it won't tip over or slide around your bench. Even when you are working on a heavy project. The whole system tips the scale at over 3.2 pounds. Much heavier and larger than others. The QuadHands is a sturdy, well built device that simply does what it was designed to do. We think it is exactly the type of product you would have built for yourself given the time and inclination. Consider getting one for your bench today. FOUR FLEXIBLE ARMS - Third hand? How about a fourth, fifth and sixth hand? That's what you get with QuadHands...4 adjustable metal gooseneck arms and stainless steel precision alligator tip clamps, with removable silicone coverings. They're strong enough to keep a tight vise-like grip and will stop your work surface from moving. You can easily walk away from your project and return to it exactly how you left it. No more juggling loads of items all at once. EXTREMELY STURDY - Our powder coated steel base with industrial strength rubber feet will ensure your workstation doesn't move, slip or slide around. Plus, the rubber feet will protect your work surface from scratches and scuffs. Our 8 inch by 8 inch work base is heavy and won't tip over even with cumbersome and heavy projects. The flexible arms won't wear out and won't breakdown because they're made of professional grade materials. ENGINEERED & BUILT IN THE USA - QuadHands started as a necessity for our own in-house USA based manufacturing and engineering efforts. We designed, tested and build all our QuadHands right here in the USA from premium powder coated steel, heavy duty rubber feet, and the best flexible gooseneck arms with high quality stainless steel clamp tips. These are good enough for use in an industrial setting, but priced right for hobbyist and DIY craftsmen and women. 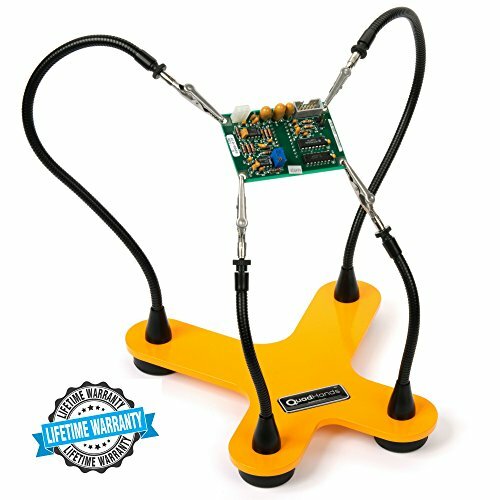 PERFECT FOR TONS OF PROJECTS - You don't just need to use QuadHands for your electronics and soldering jobs...although they're perfect for that type of work! Many customers use them for hobby projects, arts and crafts, and fine detail work like painting miniatures and figurines. Any project that requires detail work or the use of more than one hand will benefit greatly from QuadHands helping hands! 100% MONEY BACK GUARANTEE - We stand by the industry leading quality of our US manufactured QuadHands Third Hand Hobby Kit. We offer a lifetime warranty and 100% Money Back Guarantee on each QuadHands product you buy. Join thousands of satisfied customers...Click Add-to-Cart and Order yours Today! If you have any questions about this product by QuadHands, contact us by completing and submitting the form below. If you are looking for a specif part number, please include it with your message.